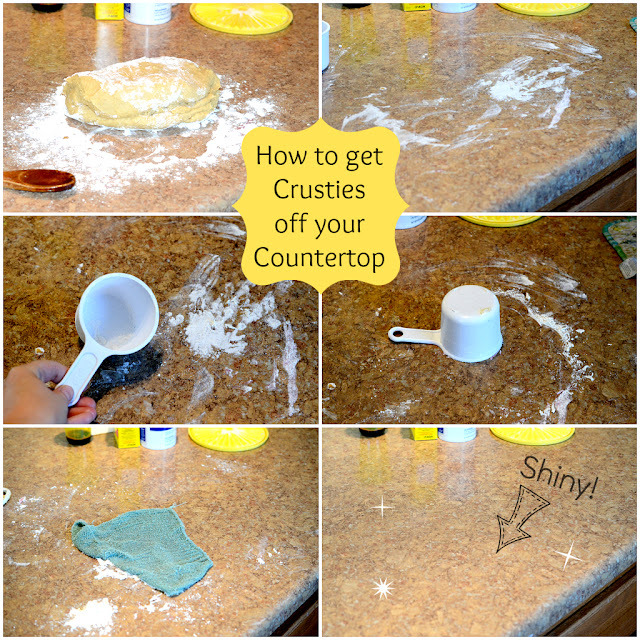 My life and counter tops are full of crusties. Your’s too? Making treats and bread always leaves gunk on my counters that I have to scrape off. The worst though is when the kids eat cold cereal or oatmeal. If I don’t wipe it up right away I need a chisel. Have you ever tried to get petrified Cheerios off your table? Miserable. I’m not sure when I discovered this trick, but it’s worth sharing the love! When a counter crusty is discovered simple wipe over it with a wet rag. Then flip over a kid cup or a used measuring cup, press on the cup, and scrape. Finish up with the wet rag and you are done! How easy is that. I just use plastic cups or measuring cups to do the scraping so that I don’t scratch the counter top. Just grab one that is close and dirty so that you don’t have extra dishes. I just use the measuring cup from treat/mess making and then throw it in the sink. There is some kind of magical leverage that comes from using the cup and the crusties come right off with very little effort. Doing this is SO much better than using a fingernail to scratch things off; I never could stand using my nails for projects like this… too gross for me. There you have it, a little trick that everyone should know. Do you have any other tricks up your sleeve? How do you clean your counters? Keep in touch! Blogging is way more fun when I get a chance to connect with you. I frequent Facebook and Pinterest most, so by all means, tag along and say hello. so simple yet so brilliant! definitely going to have to remember this little tip. Thanks for sharing!